Chicago, Atlanta, Philadelphia, Los Angeles — Brad Pitt has been popping up in theaters from coast to coast, crisscrossing the country, promoting his $250 million-plus zombies-run-amok thriller World War Z. One of the things the super-super-superstar has been proclaiming to his unsuspecting audiences: "You've never seen anything like it". With all due respect to Mr. Pitt, I have to assume: a) He doesn't watch many movies, or b) He's in desperation mode, keenly aware his ultra-pricey project's in dire ticket-selling peril. I'm inclined to pick the latter, as it's rather difficult to believe Pitt's unaware of the slew of undead-ravaging-the-globe flicks available for your consumption. 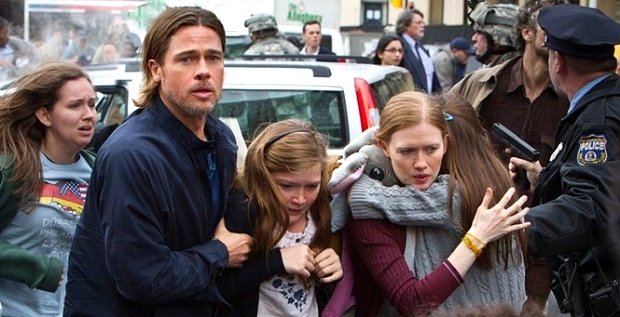 And that's the major malfunction with World War Z, we've seen it all before and seen it done far, far better. E.g., 28 Weeks Later, the Holy Grail of the zombie-contagion genre. Loosely adapted from Max Brooks' '06 novel, Pitt plays Gerry Lane, a retired UN investigator who finds himself in the midst of the zombie apocalypse, trying to prevent his stepped-out-of-a-J.Crew-catalog family from turning into flesh-eating freaks within ten seconds of a chomp to the arm. As Gerry is some sort of expert in migration across our planet (it's never fully detailed), the scraggly-haired scientist-something guy (Pitt's so believable in that role) leaps back into action, helping his ex-agency get a grip on what's causing folks to sprout varicose veins in their faces and smash their skulls through car windshields. From South Korea to Israel, Gerry goes globetrotting in search of a cure, learning – as a short-lived colleague declares – Mother Nature's a "serial killer", leaving behind "crumbs" as clues for eradicating her biological savagery. Yes, I jazzed that up a tad, but you get the eye-rolling gist of it. As for director Marc Forster's (Quantum of Solace) centerpiece scene, you've seen it in the trailer: zombies piling on top of one another, building a ladder of bodies, scaling Jerusalem's Hoover Dam-sized walls. Solid use of CGI, though the film's 3D is flat and pointless. While the back end was reportedly ditched and completely reworked, the Sliver-meets-Doom haunted house finale I was exposed to was far from inspired. Copy and paste that sediment for the totality of World War Z. Though it does dish out one potentially life-saving nugget if when zombies roam the Earth for reals: Duct taping magazines to your forearms provides fail-safe protection from the most savage of teeth gnashers. I may have underestimated the merits of this enterprise.